Saxophones are glamorous instruments, made famous by jazz legends and US presidents alike. They look beautiful, elegant and, most of all, incredibly complex. Even the thought of learning how to play one might seem impossible. However, once you get to know them better, saxophones are not as intimidating as they might seem at first. In this article, you’ll learn all the vital information about saxophones, their history, the way they work and how to start playing one. If you’re looking to start diving into the saxophone world, this is the best starting point. The saxophone is a relatively recent invention – it was invented in 1840 by a man called Adolphe Sax, and it was named after him. He patented the entire saxophone family in 1846 with 14 different variants of the instrument divided into two series of seven instruments. However, only certain models achieved widespread popularity. The most common type of saxophone encountered today comes from the original series that was pitched in B♭ and E♭ and originally intended for use in military bands. The other series, designed for orchestras, was pitched in C and F but it never gained much ground and most orchestras today use saxophones from the more popular series. Through its use in military bands, the saxophone eventually found its way to the US and New Orleans. This is where it would see its most widespread use yet – in jazz music. Early jazz bands used instruments from military bands and that included the saxophone. The first wave of popularity hit the saxophone in the 1920s and continued through the decade. This is what led to the saxophone becoming a staple of other music genres. First, its soulfulness seeped into blues music, through which it spread into Rhythm and Blues, Motown, Doo Wop, Rock and Roll and finally Pop music. Despite never gaining much foothold in orchestral music, it’s still used in that field and classical music. One of the most important parts of the saxophone is the reed. It goes into the mouthpiece, which you blow into. Since it’s made out of a natural material, usually out of cane, no two reeds are exactly the same. The reed is the part of the saxophone responsible for making the sounds in the first place, which is the reason it’s classified as a woodwind instrument. Due to this, picking the right reed before you start playing is immensely important. Saxophones use a single-reed mouthpiece, so you have to pick that reed with care if you want your sax to sound good. Here are a few tips on that. The hardness: Depending on the thickness of the reed, usually called ‘hardness,’ it sounds different. Hardness is measured on a scale from 1 to 5, from softest to hardest. However, this can vary between manufacturers. Wide-tipped mouthpieces fit better with softer reeds while narrow ones are better with harder ones. The material: The first choice is between a synthetic and a cane reed. The former is more durable and unaffected by temperature or moisture but is more expensive while sounding and feeling worse. The latter is the traditional choice – they have a lot of quirks and can differ wildly, but they generally sound and feel better. Filled or unfilled: Filled reeds have a straight cut below their vamp area, allowing them to vibrate more. Unfilled reeds don’t have that additional cut and produce a darker tone while offering more resistance. You should try out both to see which one fits you better. 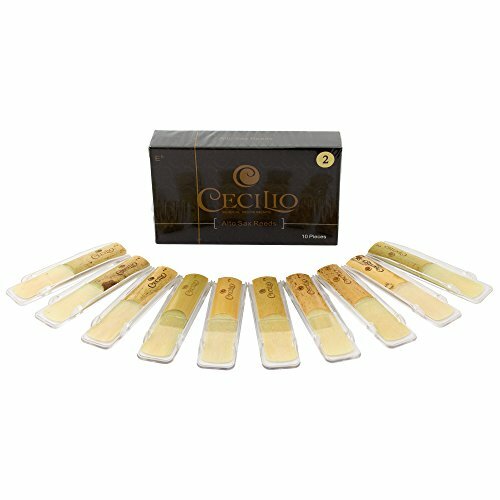 Buy individual then in bulk: To test out reeds, buy individual ones since you don’t want 10 reeds that are bad for you. Once you find out which reeds you like, buy in bulk, since it will be cheaper that way. Here’s the meat of the matter – how to play the alto saxophone, the most popular type of saxophone, as a beginner. Here’s where you’ll learn how to start your saxophone-playing career. Of course, this is not an exhaustive guide, but it is a good starting point if you want to start learning quickly and effectively. To start playing the saxophone, you need to assume the correct posture. You can play while standing or sitting down, but it is recommended that you start in a sitting position. It’s easier for you to maintain the correct posture in the sitting position and once you learn a bit more, you can also start playing while standing. It’s almost the opposite from singing postures. Choose a straight back chair that is tall enough for you – your knees should be bent at a 90-degree angle and your feet should be touching the ground. Sit, so you are slightly on the right of the chair and scoot to the front of your seat. Have your right leg hang over the edge a bit. This allows you to hold the sax comfortably and avoid banging it against the chair. Reverse this if you’re left-handed. Sit up straight and make sure your neck and shoulders are relaxed so you can breathe in easily. Keep your head straight and don’t tilt it to either side. Now that you know how to sit properly you’re still not set to start playing. You also need to know how to prepare your sax correctly. If you don’t assemble it properly, you might damage it. If your reed is made out of wood, you need to wet it before playing. Put it in your mouth and hold it for a few minutes. You can do this while assembling your sax. Take your mouthpiece and slide it halfway over the cork. If you have trouble attaching it, don’t force it – try to twist it around or just lube up the cork with some cork grease. Put the reed into the mouthpiece by gently pushing it until the top of the mouthpiece, and the top of the reed meet. If your reed doesn’t stand in place, wet it some more. Take the ligature carefully and slide it over the reed, so it doesn’t damage it. Once you position it, so it faces the bottom of the reed, make sure you tighten the screws so the reed stays in place. Thread the neck strap through the hook on the back of the body of your sax. Now, attach the neck of your sax to the body by carefully twisting it into the allotted hole. Once it’s secured and facing the right way, towards your mouth, tighten the screws. If you happen to have a plug at the top of your sax body, take it out first. If you assembled your saxophone, you need to take hold of it properly before you start playing. Only then can you start playing your first tunes. For lefties, everything mentioned here goes the other way around, if you’re playing a left-handed sax. Put the neck strap over your head and place the saxophone on your lap, so the mouthpiece is on your left side. Tighten the strap and make sure there’s no slack. Shape your hands into a C-shape. Place the right hand on the body, under the lower thumb rest, which is on the back of the sax, directly below your neck strap. Rest your fingers on the 3 keys on the bottom. On the backside of the neck, halfway up, locate a small button, the upper thumb rest. Place your left thumb against it and place the rest of the fingers on the 3 keys opposite to it. Put the sax on the right side of your body, so that the top part of the bell is resting against your leg and it’s hanging from the strap. With your right hand, push your saxophone slightly forward and up until the mouthpiece rests in front of your mouth. If the mouthpiece isn’t reaching your mouth, adjust the neck strap accordingly. Make sure your bottom lip is taut and relax the rest of your face, jaw, and mouth. Put the tip of your mouthpiece over your lower lip. Close your mouth so that you completely cover the mouthpiece and rest your teeth against it. Relax and don’t bite down with your teeth. This position is commonly referred to as an embouchure. Test if the mouthpiece is placed correctly by blowing some air without pressing the keys. If you get a clear and consistent sound, it’s good. If you’re getting a flat sound, tighten your lips around it. If you’re still getting a weak and flat sound, place more of the mouthpiece into your mouth. Now that you’re in the right form, it’s time for you to start playing your first notes. It’s not unlike singing your first notes. To play a B note, press the second button from the top with your left index finger. Press it gently and blow air at the same time. For an A note, keep your left index finger where it is and press the button down. Then, use your middle finger to press the third button down from the top, while blowing air at the same time. If you press the A note key without pressing any other key and blow, you’ll get a C note instead. To get a G note out of your sax, hold both of the previous buttons down and use your left ring finger to press down the button below the B button while blowing air into your mouthpiece. The F note is played with your right hand while holding down the A, B and G buttons with your left – the same goes for the next two notes. Press the highest of the bottom three buttons with your index finger while blowing and you will hear an F note. Keep pressing down on the F button and blow air while pressing the button below it with your middle finger to get an E note. Press down on the previous two while blowing air and press down the lowest of the bottom buttons with your right ring finger to get the D note. Once you’ve got a handle on how to play the basic notes, you can start learning more to advance your skills and start playing some real tunes. First off, you can learn the major scales – here’s a handy list of them right here. The G major scale is the easiest to learn, and you can go further from there. To play a major scale, you need to hold down the key for which the scale is named for – in this case, the G key. Then, you go through the series in order – A, B, C and finally D.
Practice the major scales until you can go through them with ease while every note is clear-sounding. Minor scales are more of a challenge, and you can move on to once you’ve got a handle on the major scales. Here’s a list of them. That’s about it for this guide, and it should be enough to get you started, but there will be more in the future – stay tuned for that. Until then, feel free to pop into the comments and ask any questions you may have, or just offer additional tips and tricks or trivia about the saxophone. If this article was helpful to you – share it around and stay musical.